Greek bank deposits are safe and the country’s lenders are protected due to a recapitalization scheme which will be completed by the end of April, Prime Minister Antonis Samaras said on Saturday. In an interview with Imerisia, Samaras ruled out a tax on deposits over 100,000 euros ($131,000) allaying fears of austerity-hit Greeks that their savings may be at risk after a raid on Cyprus depositors as part of the island’s bailout. Greek banks are consolidating to deal with a deep recession. The banking sector was shaken this week by the unexpected suspension of National Bank’s plans to integrate its newly acquired rival Eurobank after the lenders said they were unlikely to raise enough capital to stay private. Samaras said the deal depends on the recapitalization. Under the terms of the plan, a minimum amount of new equity must be raised from the market for the banks to remain privately run. “If the two banks raise the funds to recapitalize alone, then they will decide if they still want to merge. If they don’t raise the demanded funds they will fall under the control of the Hellenic Financial Stability Fund which will decide if their merger is beneficial,” he said. Bank recapitalization is on the agenda of talks with the so-called troika of EU/IMF officials visiting Athens to monitor its fiscal progress. Other key issues include shrinking the country’s spendthrift public sector and a real estate tax. 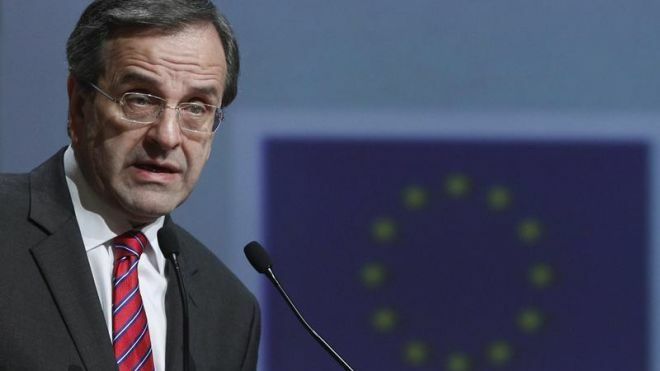 With the country’s constitution protecting state workers from dismissal, Samaras said the government could reduce staff by scrapping job positions.